This summer, my husband and I packed up and moved to Hartford, leaving New York City after more than ten years. Maybe it is the suburban air, or the change of pace, but this fall, for the first time ever, I have been really into all things pumpkin. From writing recipes that use it to putting pumpkin pie spice on everything, I’ve even occasionally been ordering the Pumpkin Spice Latte from my favorite cafe/market in Old Wethersfield. I am in full fledge pumpkin frenzy. Obviously, when the opportunity presented itself to write an original recipe using Icelandic Provisions Skyr (pronounced Skee-er), my mind went right to pumpkin (I just can’t get enough) and let me tell you, this super simple dessert is the perfect balance of homemade & store bought, meaning you can whip this up tout suite on a weeknight, or use it to impress weekend dinner guests. I guarantee you, there will be no leftovers. 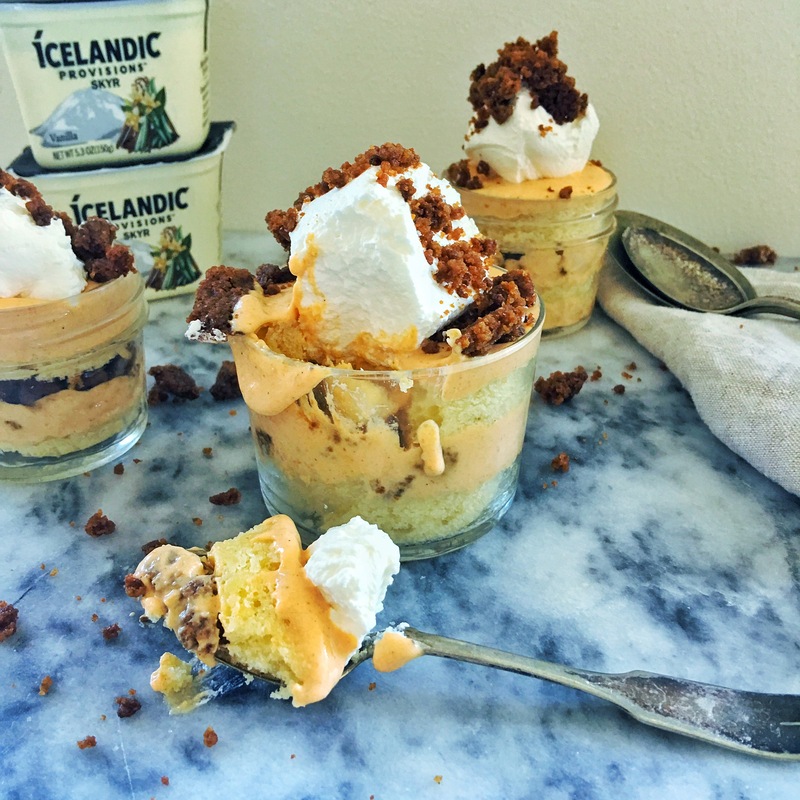 Because Icelandic Provisions Skyr is triple filtered, it provides the perfect, not too tart, creamy base for the pumpkin element of this recipe & while I used the Vanilla flavor here, you would have equally impressive results with the plain as well. Be sure to check out the contest we are running where YOU could win a TRIP to ICELAND!!! How cool is that?!? In a large bowl, combine the first three ingredients, add butter and work in with your fingers until all the butter is evenly distributed and you have a soft crumbly texture. *Note: The crumble may flatten in spots during baking which is totally fine - if this happens, use a spatula to lift and break apart when hot out of the oven - crumble will set as it cools. Using either a large trifle dish or individual glasses - cover the bottom of the dish with pound cake, cover with approx ⅓ of the pumpkin pie mixture and ⅓ of the cookie crumb topping (if using a large trifle dish) - reserving a few tablespoons of the crumble topping, repeat layering until all ingredients are used. To serve top with whipped cream and remaining cookie crumbles. This post has been generously sponsored by Icelandic Provisions and TheFeedFeed - all opinions expressed are my own.